The flare is a piece of equipment manufactured and used by the Jiralhanae. It is used to blind enemy personnel. An unarmed Flare in bright light. Flares are visually identical to radar jammers and power drains save for their yellow glow. When a player picks up a flare, the equipment piece is represented on the heads-up display by a circle with multiple rays coming from it. 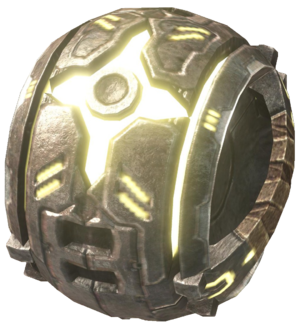 The flare functions in a similar manner to a stun grenade, blinding enemies by emitting an extremely bright flash of light. 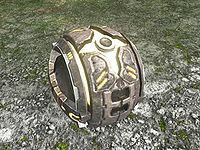 However, unlike conventional stun grenades, the flare has no effect on an enemy's hearing, and the flash of light lasts for several seconds before dimming. Personnel who are within close range of a flare are completely blinded regardless of whether their vision is directed elsewhere, whereas personnel at a distance are able to retain their vision if they look away from the flash while the flare is in operation. Flares were used almost exclusively by Jiralhanae forces following the events of the Great Schism. Though flares can be Forged into every map in the game, they do not appear in any maps by default. They used to spawn in Guardian and Isolation, but were removed during a title update as a result of the Equipment Jumping glitch, which allowed players to use flares and other items to reach inordinate heights in Matchmaking. Because of this, flares are only used in modified map variants and some campaign levels. The flare can be used to surprise and blind opponents. However, a planned strategy and a close range weapon or a type of one-shot kill weapon can be used to almost certainly dispatch an enemy in conjunction with a flare. Without a very effective weapon, it is just a nuisance, hindering you just as much as your opponent and is useful for planning your escape from your enemies. Bungie employee Jaime Griesemer described one strategy: "See a bunch of people guarding the flag? Throw the flare down. By the time the Flare's gone, their flag is too." When deploying a flare, a player will almost always find themselves within the flare's area of effect; this causes the user to be blinded. A blinded player's heads-up display, motion tracker, and reticle, however, are unaffected. This allows a target to simply look around rapidly, shooting when the reticle turns red. Similarly, both the user and the target of a flare can turn around rapidly before or as it activates, mitigating the resulting loss of vision. These traits serve as both disadvantages and advantages, depending on who uses them. Such strategies work best when used against people who are unfamiliar with them. In Campaign, the flare has no effect whatsoever on enemies. They will be able to shoot you regardless; this is because AI-controlled NPCs use a raytracing-like algorithm to detect targets, and this algorithm does not take light or color into account. If an active flare gets stuck by a plasma grenade, the grenade will cease to exist and the flare will continue as if nothing happened. Despite the blinding effect, the flare does not appear to illuminate its surrounding environment when seen from a distance. The flare equipment in action.